Want to support the continued presence of ward-elected councilors in Newton City Government? Follow us on Twitter and ​Facebook. On November 7th, 2017, Newton Voters rejected a charter commission proposal to move to a 100% at-large city council. The Newton City Council currently has 24 members. Each of the eight wards has one ward-elected councilor (elected only by the ward to represent them and to be accountable to them), and two At-Large Councilors, elected city-wide. ​The most significant change in the charter commission proposal is the elimination of the city's eight ward-elected councilors and half of the at-large councilors. It instead specifies twelve at-large Councilors elected by all voters city-wide: one residing in each ward plus four residing anywhere in the city. The charter commissions report can be viewed here. Note this report is an advocacy piece and not an objective summary of the proposed changes or associated data. why are the proposed charter changes bad? Currently, membership on the City Council is allocated evenly throughout the city, divided between councilors elected city-wide, and those elected solely by each ward. This allows for diverse voices to be heard from across the city. 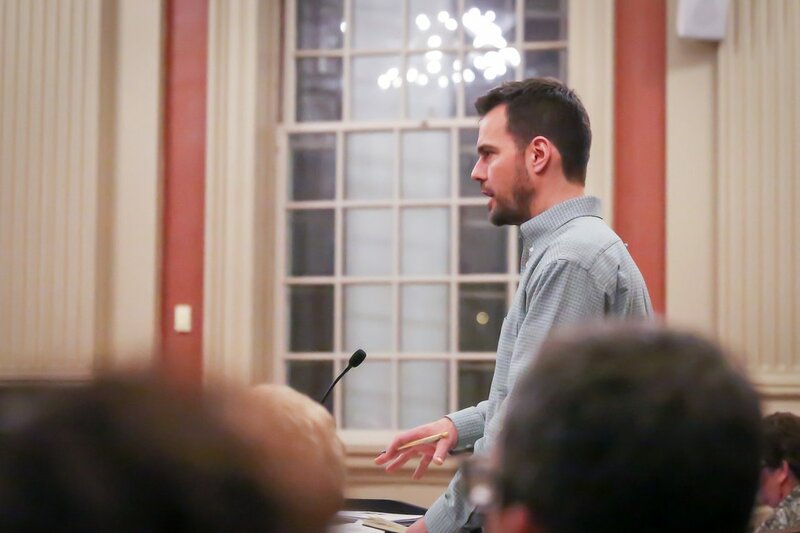 Under the proposal, five of twelve councilors could be elected from just one small section of Newton, disenfranchising residents in the remaining wards from equal representation. ​Experience from other communities shows that in such a scheme, councilors tend to be less socioeconomically diverse and clustered in one part of a city. 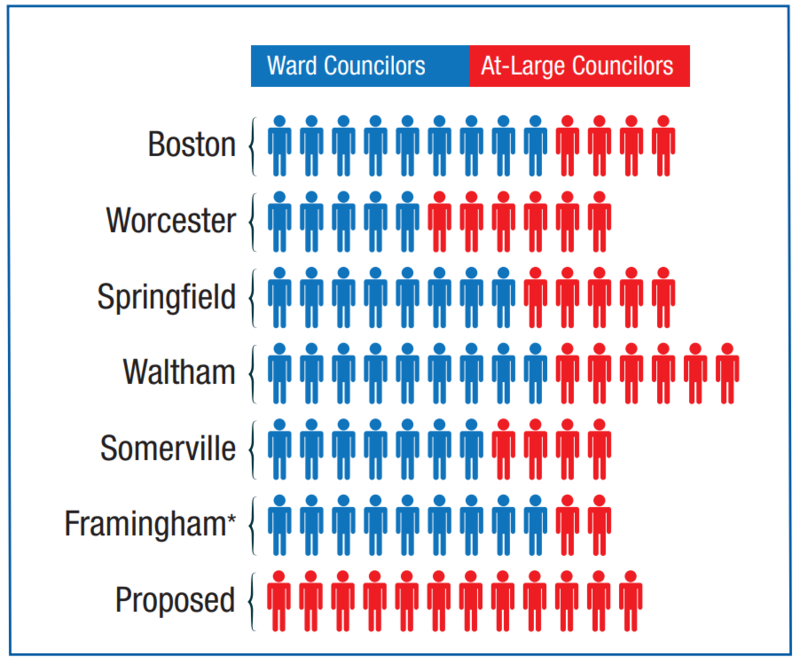 Why would we move to a system in which five out of twelve councilors could all come from the same ward, rather than our current system, in which each ward has an equal number of City Councilors. The proposal eliminates the 8 ward-elected councilors who provide us with village-level constituent service and advocacy. This is not a system that retains ward representation. If this change passes, no ward will have a councilor directly focused on, and accountable to, its residents. ​​By eliminating the Ward Councilor, we would be removing the councilors many citizens know best, as they are often the first stop for help with traffic safety concerns, sidewalk repair, or to remind City Hall about an unfulfilled 311 request. The Ward Councilor is accountable to local voters, because if he or she isn’t responsive, the ward can vote him or her out. But with a citywide seat, a councilor can be unresponsive to the ward, even lose the ward vote, but still easily win re-election, simply because the city is so big. 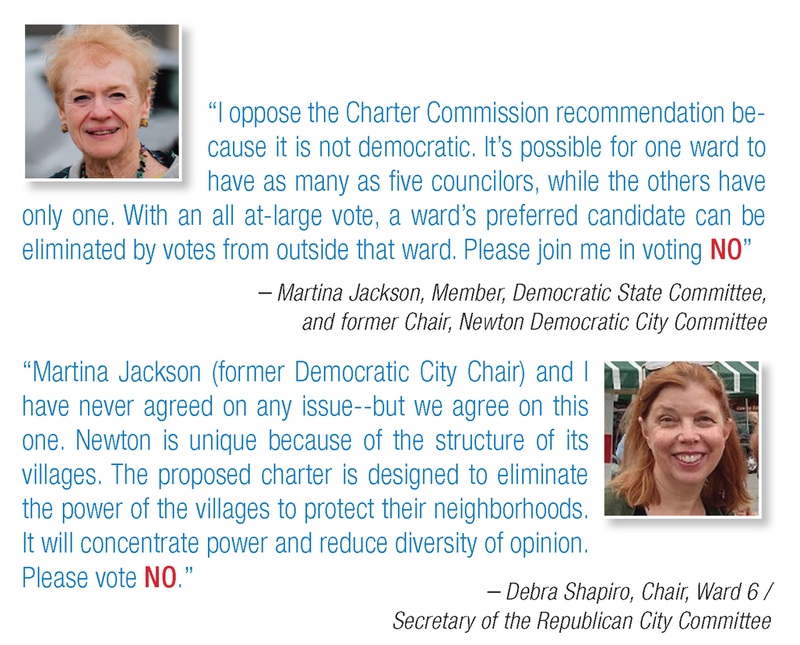 ​The Charter Commission proposal makes it easier for special interests to influence our City Council. Under our current system, Councilors, especially Ward Councilors, cannot ignore their constituents. In the case of large development projects, for example, Ward Councilors ensure the concerns of those most affected are carefully considered and development projects are often significantly improved with neighborhood feedback. ​ The 4 pick-4 seats are intended, according to the commissioners, to be oriented to special interests. Councilor Norton Comments on Newton Charter Review from NewTV on Vimeo. 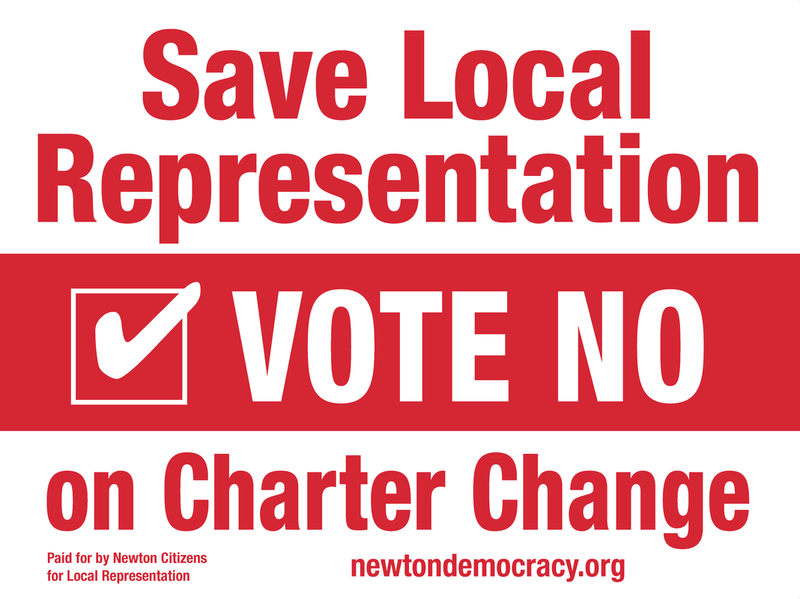 Subscribe to our email newsletter and follow us on Facebook and Twitter to stay up to date on the latest efforts to stand up for local democracy and defeat the charter proposal! Questions? Concerns? Want to connect with us? Send an email to info@newtondemocracy.org.